I love cooking! So it should not come as a huge surprise that I decided to thrown an April Fool’s Joke on my family using food! The cake was actually meatloaf baked in round baking pans. 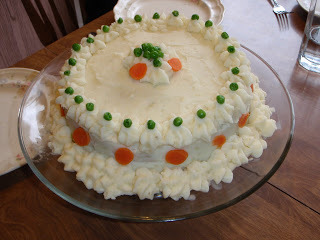 The frosting was actually mashed potatoes that I used to hold the meatloaf together & then to pipe onto cake to give it the appearance of a decorated cake. I finished it off by plucking on peas & carrots as a garnish. Not only did it look awesome, it was actually delicious! My husband thinks it’s the best meatloaf he’d ever had. I think the masked potatoes helped keep moisture in the meatloaf. This was actually a completely dessert entree! In the middle of the plate I put a slice of pound cake. I then piped vanilla frosting criss-crossing the pound cake to give the appearance of noodles. I topped the icing noodles with Strawberry Sunday Topping ‘Tomato Sauce’. 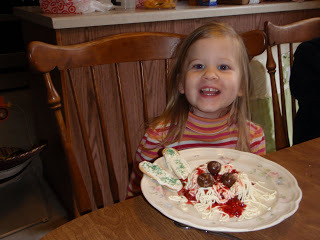 Then I used a knife to dull Whopper candy and plopped these ‘meatballs’ on top of the ‘spaghetti’. On he side I served ladyfingers, iced, with green sprinkles to look like garlic bread. To say the food was a huge, fun surprise would be an understatement. The kids enjoyed it immensely. I am so glad I was intentional about doing something fun, creative, and memorable.